This is an advert from way back in 1978. The purpose of the advert was to warn Londoners about pending drills relating to the flooding of areas close to the River Thames. 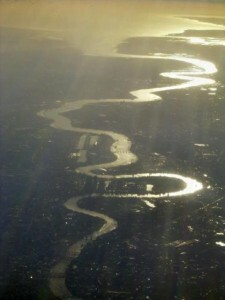 With a total length of 215 miles (346 km), the Thames is the longest river entirely in England and the second longest in the United Kingdom. It rises at Thames Head in Gloucestershire, and flows into the North Sea at the Thames Estuary. It has a special significance in flowing through London, the capital of the United Kingdom, although London only includes a short part of its course. The river is tidal in London with a rise and fall of 7 metres (23 ft); tides reaching up to Teddington Lock. The catchment area covers a large part of South Eastern and Western England and the river is fed by over 20 tributaries. The river contains over 80 islands, and having both seawater and freshwater stretches, it supports a variety of wildlife.